too much, so couples and families can fully enjoy it. The Masseria Montelauro is located in the hinterland of Salento, 2.5 km from Otranto and the sea, in the peaceful silence of the countryside. The restoration of the Farmhouse, built in 1878, has been done respecting its original nature, just as we have retained all the colours and fruits that have always characterized our countryside in the garden that surrounds it. The only modern touch is given by the swimming pool in the inner court surrounded by the orchard. The distance from Bari airport is 200 km and from Brindisi airport 95 km. 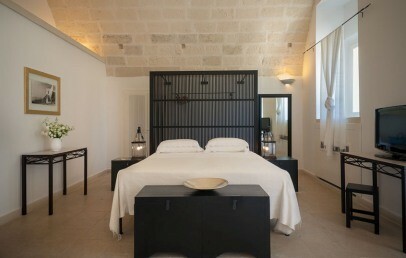 The Apulian farmhouse has 29 accommodations created in the ancient structure of a monastery. The interiors and the atmosphere are typical Mediterranean and furnished with great care to the details. The rooms have all different sizes and all of them are equipped with modern comforts as air conditioning, minibar, hair dryer, pool towel, safety box and TV. 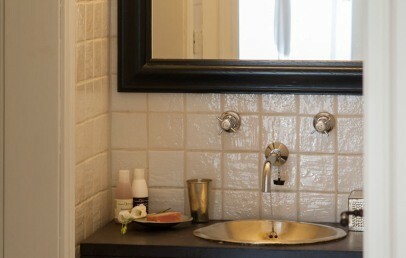 Classic – are double rooms with bath with shower, 3rd additional bed available only on request. 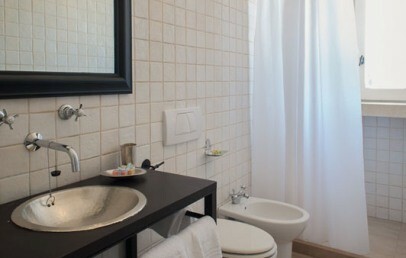 Superior – are larger than the Classic and characterized by barrel vaults and stone-decorations, bathroom with shower only one with tub; a 3rd additional bed is available only on request and as well 2 connecting double rooms Superior. Junior Suite – is larger and the bathroom has a shower. 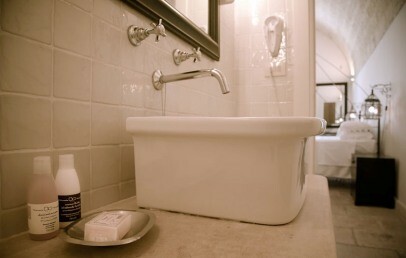 Suite – is a one-bedroom suite with night- and day-zone, the bathroom has a tub. Most of the rooms have a direct access to the garden or the countryside. The connection Wi-Fi is complimentary and works only in the common areas and outside the rooms. The cuisine offers the typical dishes of the Mediterranean tradition: lunch and dinner have an à la carte menu, offering dishes of land and sea. The breakfast can be served under shaded bower. In the hall, the sitting area with fireplace creates the right atmosphere to relax and sip a drink. On request it can be organized horse-back or bicycle excursions, massages and beauty treatments. The Wi-Fi connection is complimentary and it only works in the area of the front desk and in the garden area by the pool. In the rooms the signal does not go through due to the thick walls. City tax – The municipality of Otranto requires the payment of a tourist tax of € 2,00 per person/overnight during off-season and low season and € 3,00 per person/overnight during high season (july and august); due for a maximum of 7 overnights; children under 12 years exempted; to be paid on spot. 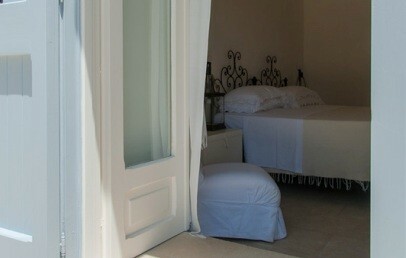 Double room furnished with care to details and with a typical Mediterranean atmosphere. The bathroom is equipped with shower, hairdryer and pool towel. The Superior rooms are larger than the Classic. On request a 3rd additional bed is possible or 2 connecting rooms. It is characterized by barrel vaults and stone-decorations, they are furnished with care to details and equipped with all the modern comforts. The bathroom has shower, hairdryer and pool towels. 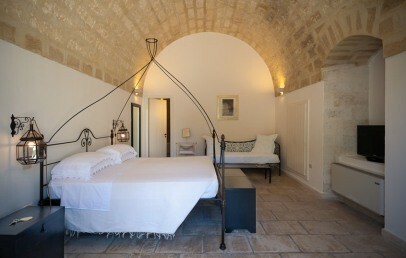 Spacious Junior Suite created in the ancient structure of a monastery. It is furnished with care to details and with a typical Mediterranean atmosphere. The bathroom is equipped with shower, hair dryer and pool towels. A nice and spacious open-space Suite with living zone with the possibility to add a 3rd bed. 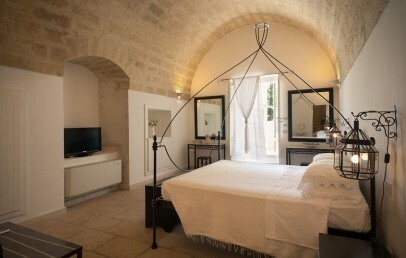 The Suite was built in the ancient structure of a monastery and offers a typical Mediterranean atmosphere. The bathroom is equipped with a tub, a hair dryer and pool towels.